If you haven’t heard, I’ve taken on a 3,500 sq ft, physical brick house of a project over the last few months. The home is located near Seattle in Bremerton, a town that I think is poised for growth that I love living in. I began the remodel in May, and have relocated from the Bay Area to take a bit of time off work to get my hands dirty. You can learn more about my home remodel at vagabuilding.com, a blog I’ve set up specifically for the fixer upper and co-living project. If you’ve got a pad and consider yourself a “sharer” in today’s airbnb, get in a stranger’s car, let’s consume less type of kumbayah world, please keep reading. My girlfriend Sarah and I are interesting in house swapping with you or your friend during the 4th of July weekend (or nice people in general we can trust). Airbnb is cool, but we figured swapping pads could be a mutually beneficial way to spontaneously travel somewhere (and for no monies). House swapping with someone we know or a friend of a friend would ensure trust and safety. Lodging is often the most expensive part of traveling. We’d rather spend it on nice meals, exploring a city, or blowing it at the stripclub (joking about the last one if you don’t know me). It’s not worth the effort to Airbnb the house for a weekend. Every freaking campground in California has been booked for a year, so this is the next best thing. Why not have someone enjoy our house and location while we’re gone? It’s an interesting experiment. What if we could swap with people for a longer 1-2 week duration? Let’s go international :-). Interact with some cool people possibly in this experiment. *I can take pics of living room and bedroom no prob. We live in Palo Alto, California where we were lucky to land a cozy 1 bedroom cottage. Palo Alto is a fancy town in the center of Silicon Valley that’s 35 min from San Francisco. We want to explore a city or town for the long weekend. Vancouver? Sonoma? Bend? Mississippi? Sure. We’re open to anywhere really. Have a place to possibly swap? If you may be interested, don’t be bashful and get in touch. Our friends say our home has a country cottage type vibe. We’ve got giant oak trees in the backyard, a hammock, outdoor fireplace, and chirping birds. Again, kumbayah. Walking distance to one of Palo Alto’s downtowns known as California Ave. Nice shops, grocery store, farmer’s market, and a commuter train to San Francisco are all within walking distance. We’ve got two bikes you can use to get around, a nice hike nearby, and a vegetable garden you can snack on. In our humble opinion, it’s a pretty sweet spot. An apartment or home (we prefer an entire unit, but are open) for us to stay in Fri June 30, (or Sat) to Tues, July 4 (leaving Tuesday, that is). We’re def down to fly domestically or abroad if it makes sense. We’d want to chat with to ya and make sure we’re both comfortable with the swap. As long as you’re a reasonable person/persons, I don’t see why this wouldn’t work. Don’t know me but have an airbnb profile? That works too! Here’s mine. Swap pads with us. minus the rooster. So if you’ve ever Airbnb’ed or uber’s around with a stranger, don’t be afraid to get in touch. Even if we haven’t interacted for years or are casual acquaintances, don’t worry. Let’s save some coin together. If July 4th doesn’t work, but another time period might, send me a message too. My email is sing.drew at gmail dut com. Who knows, maybe we can start a friends network of house swapping for vacays. That’s be sweet. So your startup wants to rank #1 on Google for your keywords. You also want to be covered by top-tier publications like WIRED and TechCrunch. Here’s how you can do both… In one fell swoop of a process. We’ll call is SEO-driven press. With an understanding that SEO and press don’t happen overnight, you’ll start getting coverage that will help improve SEO with backlinks from domains with high page ranks. In this comprehensive guide, I assume you’ve figured out what type content and narratives make sense for your business based on keywords, your target audience, keywords, etc (ping me if you’ve got questions on this). 1 full-time headcount is required to execute this process. A talented intern or junior level headcount can get you going on SEO-driven press. Ideally, you’ll have a manager who can help drive the content and stories with an intern who can collect outlets, emails, and help distribute stories. Specifically, Unique Linking Domains from sites with a high PageRank (6 and up). This will increase your domain’s PageRank, which will lift keywords you rank for on Google. Popular media outlets (Forbes, Business Insider, etc) have PageRanks of 6 and up, but how do you get backlinks from these sites? The answer is consistent distribution of quality stories — aka pitching or helping them with a story that will provide value to their audience. Brainstorm outlet groups (I call them buckets) that would be interested in this particular post/story. Toupees, aging, men’s fashion, men’s hairstyle, hair loss. Each of the above buckets opens up a new demographic of potential journalists that may find value in your story. For example, an AARP writer who’s written about aging may be find value in this story, as well as a contributing writer who’s covered men’s fashion in Forbes. Once you’ve figured out the buckets (outlet groups) for your content, it’s time to find the outlets. Buzzsumo — See popular content based on keywords. A favorite tool of mine. Moz Open Site Explorer — If you have a Moz account, this is a solid way to do content research. Google News — Good results for recently written news. Google Alerts — Provides emails to your inbox when your selected keywords are published. Example: if you want to figure out if any TechCrunch article contains the phrase “puppies”, simply type “site:techcrunch.com puppies” (without the quotes) into the search bar. Now that you have a list of relevant articles and journalists who, based on their prior articles, may be interested in your story, it’s important to be disciplined and understand how helpful that domain is SEO wise by checking the root site’s PageRank. Install a PageRank checker chrome extension like this one. To use it, simply navigate to the home pg of that site to see its PageRank, which is a good barometer of its SEO juice. This is where the party gets started (and an intern is quite helpful). Hunting down email addresses that aren’t publicly displayed takes some time and effort, but once you have your ideal contacts, they’re yours forever. On the easy side, some publications already have emails listed in articles, like Business Insider. If the article doesn’t display an email address, which is most of the time, here is the step by step process I like to use to find it. Check their Twitter Bio — Around 20% of the time, a reporter will list their email here. Google their name — Search for their email in their personal blog. LinkedIn Profile — (usually under additional info/advice for contacting). One way to manage your list of journalist info is a good ole fashioned spreadsheet. I use Buzzstream, which is a CRM specifically for press contacts. It makes organizing contacts a bit easier with tagging tools, and stages you can mark a journalist (replied, successful placement, etc) Any CRM could actually work though based on the process you setup. You’ve got a quality story. You’ve got contacts. Now you must distribute a story to them. There are a lot of email tools to help you make this happen. Yesware — A quintessential sales tool, yesware allows you to track opens, CTRs, and execute mass mail merge campaigns to email multiple contacts at once. Outreach.io — I’ve heard good things, but haven’t used it. Sending out a canned email without any personalization to journalists is ineffective, but hand-writing every single one isn’t efficient. Luckily, with your email tool, you can specifying customized fields in your excel sheet. Make sure to insert their first name, as well as a 1–2 personalized sentences to start off the email that shows you’ve done your research. Provide a detailed story and images so the journalist has less work to do. Better yet, get on a call with them. I now sleep better thanks to your “how to sleep better” article on TC. My phone is now banned from the bedroom thanks to you! Since you’re an expert on sleep, I thought your readers may be interested in this story about a girl who slept for 24 hours straight would be helpful for ya. Her name’s Betty, and she’s a 14 year old girl who sleeps for 24 hours when she eats seven turnips! She’s immigrated to SF form Astonia, and will be competing for the sleep world record next month in LA. I’d be happy to provide images, a detailed story, and even connect you on an exclusive call with her. Let me know if Betty would be interesting to your readers Bob! The more time a journalist invests in learning about your story/company, the better the chances are that they write about you. Once you’ve gotten replies, get personal. Build real relationships by personally replying with thoughtful emails to journalists. Remember, they’re real people. The semi-automated processes stop here! If they don’t cover you for the current story you’ve pitched, that’s okay. Remember, you’re playing a long-game so in the future they may cover you if you’re being helpful. So they’ve committed to writing about you. Hooray! If you’ve helped provide a story, there shouldn’t be an issue when asking for a backlink. Worst case is they’ll say it’s not under their control. No worries. It happens. Have Questions? Feel free to get in touch @drew_sing. This is a first pass at documenting this process (got tired and decided to publish this so far…), so let me know if you’d like to discuss further. Running a family manufacturing business is hard. Especially when the owners are aging immigrants who both require surgeries and don’t have an exit plan. My parents are the founders of a mom and pop manufacturing business called SingCore. This is a recap of my summer assisting them in business and in life. My Father Peter began experiencing severe nerve pains earlier this year, which he soon learned would require three of his vertebrate to be removed by way of cutting into the front and back of his neck. Pleasant, I know. Peter has been a serial entrepreneur and inventor his whole life. Since 1990, he invented and sold his own log home, survived the Great Recession, and now manufactures a patented lightweight panel that’s utilized for oversized doors and museum walls. It’s a phenomenal product that has been utilized by NASA, The Center for Architecture and Design, and SFMOMA (they’re also installed in Airbnb’s headquarters). As Paul Graham would call it, Peter is a gritty cockroach who knows how to survive. But he’s never grown past the garage startup phase. Building a team and management aren’t his strong suits, so when he reached out to me to try finally get his business to grow while he would be recovering, I had to stop and consider his request. It was May, and I was in the middle of interviews with companies in San Francisco (I had just returned from a backpacking adventure in South America). I decided instead to step away from tech and fulfill my Dad’s wish to have me help out with his company. Throughout my whole life, I’ve intentionally stayed away from the family business to establish myself independently. 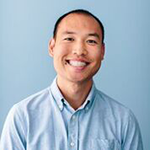 I attended university out of state, worked in Australia for two years, and have spent my my recent years working in San Francisco as a Growth Marketer. Growing up in the family business, I experienced the struggles and saw firsthand the stress involved in running your own factory and company. Especially as a first generation husband and wife team. But if there was ever a time for me to help, it was now. My Mother’s hand was hurting too, which required surgery in August as well. So I put my own self interests and professional pursuits on hold to work and live at a sawmill in Washington for the summer to see if I could kickstart this unique manufacturing business. Everything was done the old fashioned way. Leads were manually forwarded to our Sales Manager, which my Dad managed with his sweet CRM called “gmail stars”. I took aim at modernizing and organizing the company. It started with redesigning the entire website, then establishing a CRM (Pipedrive) to manage not only sales leads, but our entire factory production flow. Instead of walking hand-written orders, we were digitalizing the entire funnel all the way to the end shipment. It was a laborious process that the entrepreneurial side in me enjoyed. My biggest task was to build a small team so my parents would not have to be at the mill day to day. We hired a talented young jack-of-all-trades named Forrest, and an experienced Sales Manager named Nick. They’ve stepped in and have made tremendous improvements in SingCore. I helped close sales. I tracked finances. And as a marketer, I revamped his entire online presence. It was a great learning experience to touch all aspects of a small manufacturing business. Our Factory Manager was extremely supportive as we tag teamed on various process improvements. Family time or career time? Just as importantly, spending my summer in Washington allowed me to visit my Father on the weekends as he recovered. Once he was in shape to return home, I’d do what I could to help out with daily tasks that have become more difficult for him. It’s tough to take time off from a competitive career such as online marketing. There were times I felt this decision would hurt me professionally, but at the end of the day, I’ve still gained new skills. Just as importantly, have been able to provide assistance to my parents during this time. I think it’s tough for millennials to sacrifice their interests for their parents at times. We’re self-absorbed in our own pursuits and futures, but can at times, forget those that have help mold us into the people we are. Spending time with my parents has deepened our relationship, which is something I’m quite grateful for. It’s October now, and I’m now back in the Bay Area still helping out by working remotely. I’m most pleased with the team we’ve been able to hire and nurture, which has alleviated a lot of stress for my parents not having to be at the mill every day. The business is something my Father would like me to take over, but not something I’m comfortable with. My life is here in the Bay Area. Working remotely is going well, but returning to the startup world at the right company is something that I’ll be entertaining as well. A big thanks go out to my sister Annie, David Gibson, our Factory Manager, the entire SingCore team, and of course, my mom and dad for allowing me to help out and make a few updates to the business. It’s been an eventful Summer, but I’m glad to be back in California and am excited to begin exploring my next move. TechCrunch recently published an article I wrote on the intersection of coding bootcamps and colleges. What are your thoughts on colleges now getting involved in the coding bootcamp space? And a thanks to Gregg Cox, Nick Ducoff, Darwish Gani, and Abhi Ramesh for helping make this article happen :-). There’s a lot of commotion around the importance of a growth team, but what steps are involved in successfully establishing one? It’s a frequent discussion I’ve had with friends in growth, so I thought it’d be helpful to outline my seven steps to starting a growth team. Growth isn’t a role you simply hire for and expect to drive results independently. To optimize growth, it involves input from all departments and is a strategy the entire company is aligned with. Because what role or department doesn’t want the company to grow?! What type of hire should it be? It’s important to be realistic though when starting a growth team. Hiring a lead Growth role is the first step. This person should be knowledgeable in the suite of modern marketing tools, yet has engineering experience and can effectively work with product. Scrappiness and ability to define an actionable strategy are two essential traits for this role. Growth teams that are highly technical and include engineers can move faster, but this is not a requirement as long as part-time engineering resources can be allocated for more technical tasks. Boiling down your startup’s definition of growth into one simple metric the entire company can understand will help streamline your growth strategy. This activity isn’t difficult, but requires your growth manager to understand your business model and offering at the deepest level. For example, should your metric be the # of Monthly Active Users (a metric utilized at Pinterest) or the # of leads your company is generating? These sort of metrics provide insight, but which one is the most appropriate definition of growth for your company? Experiments will be designed based on this metric, which means you will want to keep it constant so you can make actionable decisions based on these results (I recommend committing to a metric for at least 2 quarters). Note that it’s important to have secondary metrics to help with analysis, but when forced to make a decision, being able to point to a source-of-truth metric will streamline this process. This allows your growth team to easily prioritize tasks and set goals when increasing and optimizing for this metric (see next point). One metric also allows the entire company to quickly understand how their work affects growth. At the end of the day, all departments can positively impact this metric since it’s all encompassing. This is powerful, as it can align the entire team to contribute and help increase growth. A growth experiment list is the list of all the experiments your company is interested in running. Experiment examples include an A/B test (copy, emails, design, etc), new product features, separate growth projects, or any other changes/updates that can be measured. A list is essential because it allows a growth manager to prioritize which experiments to set up and execute based on its impact potential, chance of success, and effort required. I like to use Sean Ellis’ ICE process to help with the prioritization process. Impact potential. What sort of results could this test provide? Confidence in its success. What are the chances the experiment will succeed? Effort required. Will an engineer be required to build out this test? How much time will it take? It’s now time to put those prioritized experiments into play. Proposing what “success” means before execution is helpful for reference later. Have your team aim to have a certain number of experiments pushed out each week (3 is a good number to start). A scrappy, get things done growth manager and team are essential since growth involves a variety of marketing tools and skills. For more technical experiments, this is where allocating engineering resources, whether it’s part-time for a small startup or a full-time headcount for a larger company, comes in. It’s important to utilize ICE as a source-of-truth when reviewing whether an experiment was successful. Or not. Oftentimes, there won’t be a clear cut winner, which is why the agreed upon metric and definition of success should be used as a reference. Implement the improved experiments, push more tests, and repeat! Keeping track of what has been run is key, and provides clarity over what strategies have been tested. Every role at your company has expertise within their domain on how to increase growth, which should not be ignored. It’s also natural for one person or a small team to eventually run out of great experiment ideas. By allowing anyone to propose growth experiments, you enable everyone to be a part of growth, which is a key to developing hypotheses that increase the quality of experiments on your list. Build a process to enable participation by the team. Examples include setting up an experiments@ email address or google form that allows an employee to submit an experiment and its proposed ICE. Communicating growth updates to the team should be welcome, whether via a scheduled report or update session. With that said, the growth team is the owner of the experiment list, which should be clear when setting expectations with the company (similar to a product roadmap). Opening growth ideas to the whole team can become a distraction when not managed properly, which is why keeping metrics, strategies, and goals simple and transparent are important. You cannot expect all experiments to be successful. Doing so would stifle your team, and limit the amount of “high impact” growth experiments your team goes after, which occasionally lead to significant results conservative tests cannot achieve. It’s similar to a batting average. If you only go for conservative singles, you’ll never get that home run experiment that provides a jump in growth. Cat Lee, the Head of Growth at Pinterest, has her team define tests two basic categories. 70% of their experiments affect the core product and are of medium ICE levels, while the remaining 30% are “moonshots”. Moonshot tests may be of a lower confidence level and require increased effort, but could provide drastic increases in growth, warranting their development. A healthy balance of experiments should be emphasized by the growth team, which help provide diverse wins of varying impact. If your growth team is proving its ability to accelerate the trajectory of your startup, work on providing additional resources to your team. It’s important to keep the cadence of growth initiatives consistent, and increase resources when they’ve proven successful. The quicker your team can move, the sooner you’ll receive results. A growth team should consist of PMs, engineering, and marketing-related roles that can execute non-technical experiments. I’m a big fan of collaborative consumption models, so once we had our Yosemite camping trip planned out minus the wheels to get us there, I was excited to try out FlightCar’s rent-a-someone-elses-car-for-cheap model. There were a few bumps, but overall, I’m pleased with the experience. If you’d like to save $20, go ahead and use my FlightCar Referral Code – GRDF. Thanks! I have a WA State license, which required me to pay for a $13 DOL report. FlightCar’s emails didn’t clearly state that they would be refunding me for the fee, so for awhile I assumed I was eating the expense, and began to get a little weary about what other potential fees there may be with my first FlightCar rental. $13 isn’t a lot, but no one likes the feeling of surprise extra fees. FlightCar could help its own cause by making sure it’s clear they will cover this cost. Making sure all the little step a customer takes are positive ones is crucial for a startup that requires as much trust as FlightCar. I arrived San Bruno BART and called for my pickup. Within minutes a large Ford Excursion pulled up and I got in. Speedy! I was a bit surprised. There were fancy glasses in the back, but no access to water or drinks, which was odd. 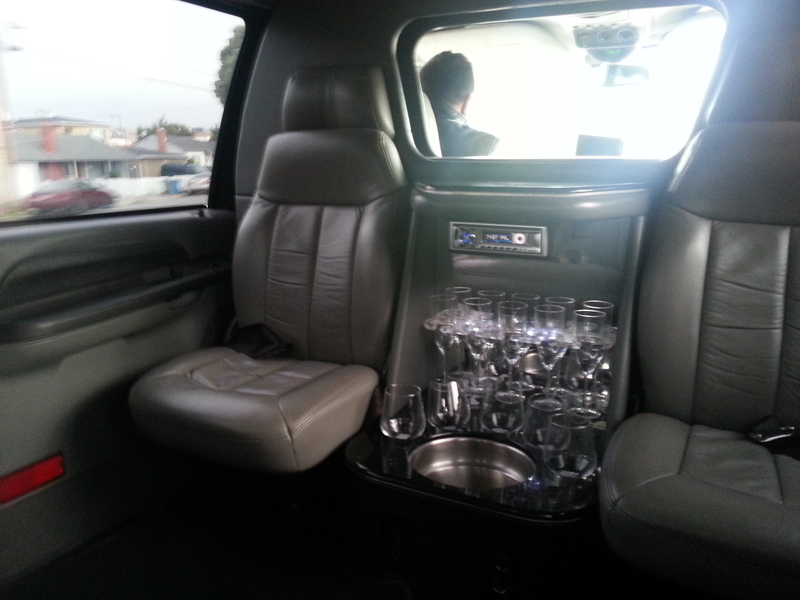 Seemed as though FlightCar was trying to come off as a luxury service with the glasses, but it fell a bit short. Branding wise, it may not make sense to present an image of luxury when FlightCar’s brand is build on sharing cars and the cheapest rates. A random sedan or minivan would have been more than acceptable for a pickup since FlightCar is all about the use of random vehicles anyways :-). Right when I got out, I was lead straight to my car. This was the most exciting part of the rental process. It’s beautiful when compared to the lines and paperwork we’ve all gone through at Avis and Hertz. No lobbies and no stressed out families with the crying baby in your ear. It was at this moment when I had that feeling of “yes, FlightCar is awesome”. The fact that this is such a hassle free process is an opportunity for FlightCar that should be touted on the site and in its marketing. No lines, no paperwork. Just keys in your hand when you arrive. I was provided a Prius, which looked great, but was a problem since I requested a 2001-2008 mid-size sedan. Normally, this wouldn’t have been an issue, but because we were headed to Yosemite with a group of four plus camping gear, we needed a more traditional sedan with more storage. I was tended to by Fred, who was very helpful and courteous during the vehicle switching process. I waited about 10 minutes, and was provided a Subaru Outback. Fantastic, now we can go Crocodile Dundee in Yosemite and make those rugged nature commercials a reality :-). The Outback was clean and ready to roll. There was that moment of awkwardness familiarizing yourself with a new vehicle and asking questions that you don’t read in emails. How much gas do I need to bring it back with? How many miles/day can I drive? A basic brochure with standard rules would have been helpful, but not a huge deal since all the info is online. If FlightCar was interested in going the extra mile, a little surprise waiting for the customer could be a nice customer experience touch as well. Often, it’s the little unexpected efforts that make an experience worth remembering and talking about. Gagan Biyani, Co-Founder of Sprig, mentioned how their meals come with a little chocolate that is an unadvertised surprised. His feedback has shown it’s one of most memorable parts of the meal, yet is not the most expensive. Perhaps a chocolate or as a fun novelty (California paper maps, those things you had to fold!) would be fun to have when you jump in your first FlightCar. While driving through the Valley to Yosemite, we realized the Subi didn’t have AC. FlightCar never states that AC will work, so just be aware in case you’re doing some desert driving. Not a huge deal since it’s the best rental deal in town. Guess we can’t have it all. If you’re driving a vehicle that costs less than $30/day, it may be cheaper to simply extend your Car’s rental if you plan on driving more than the allocated 90 miles/day. For example, I booked my car for 3 days (270 miles allowed), but clocked over 550 miles on our Yosemite trip. So instead of being charged an additional .45 cents/mile, I simply extended my reservation an extra 3 days (540 mile limit). You can always return a car early at no additional cost. Returning the vehicle was easy. The staff do a quick inspection (1-2 minutes), then drop you off at the San Bruno Bart . Convenient. And that’s it! Overall, the experience was a pleasant one. I may be utilizing FlightCar as a Zipcar and RelayRides substitute (services that I also use). 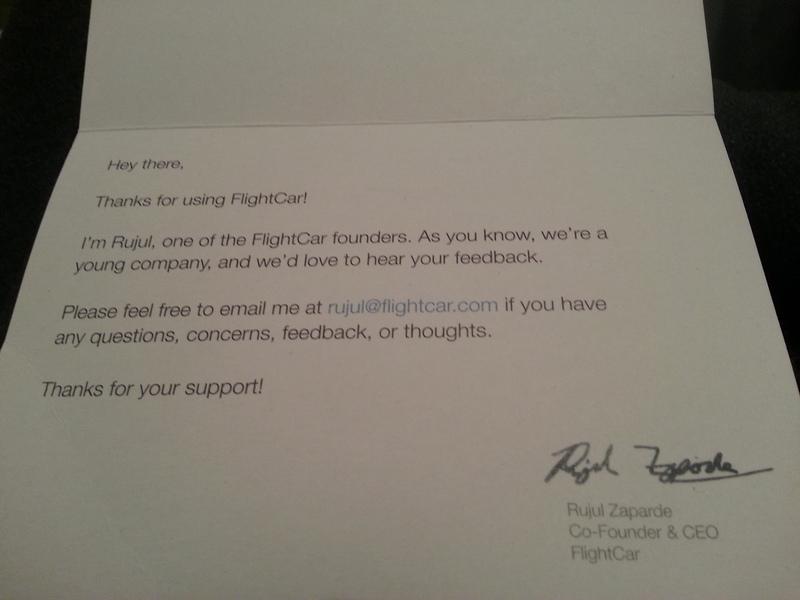 Thanks Rujul and the FlightCar team! If you’d like to save $20 on your Flightcar reservation, feel free to use my FlightCar Referral Code – GRDF. FlightCar could begin setting up hubs in cities for people to rent vehicles outside of airport locations in a similar fashion to RelayRides and Zipcar. When transporting cars to and from a hub, they could also pick up customers on the routes as well to provide an extra service not offered by competitors.